Check out the new "album art" for the podcast, courtesy of the great Justin Labarge. I basically wanted to get the name of the show on the pic, so mucho thanks to Justin for coming up with this and a couple of other versions. Woo hoo, another short week! Almost makes up for this constant stream of crappy weather. This is the worst month of June in terms of weather in recent memory. Somebody told me today that it has rained 25 of the 29 days this month. Damn. So I was supposed to run 15 miles on Saturday as my week 2 long run in my 16-week marathon training plan. Last week, I was supposed to do 13 and only did 10. This weekend, once again I just didn't have the energy or the desire to do 15; my body felt fine, but the will wasn't there. I ended up doing 10 miles in very humid weather and struggled to get through it. As I was trudging along, I came to the conclusion that I just didn't want to fight this fight for the rest of the summer. If I can't get fired up to do my long runs in the first two weeks, how am I going to be eight or 10 weeks in? As a result, I've decided not to run a fall marathon. Fortunately, I hadn't signed up for Maine yet. The seeds of this were planted during last week's run when I thought that maybe I'd train for a month and see how I felt, but now I think I don't even want to get that far into it. My right IT band is still pretty tight from running Boston and there's no sense making it worse. I still have Reach the Beach to train for in September, and I'll probably run a half-marathon or two in addition to that. And I'll do some shorter races this summer and recharge the batteries. I still enjoy running, but I wasn't enjoying the long runs. I can shoot for a marathon again next spring. I've begun an endurance event of another kind: Infinite Summer. Participants are endeavoring this summer to read the late David Foster Wallace's 1996 magnum opus Infinite Jest. It's sort of the War and Peace of modern times in that it is an intimidatingly long (1100 pages), critically praised novel that many folks may have purchased back when it came out but never made it all the way through. I never picked it up back then, but I've always wanted to tackle it, so I figured why not now? Infinite Summer runs from June 21 to September 21, just like the real summer, but I was unable to procure a copy of the book until Saturday. I had hoped to buy a copy but the local Barnes and Noble was all out, so I got it from the library. It's the hardcover edition and is a beast to carry around; I might pick up the paperback at some point just for convenience sake. At any rate, I'm about 50 pages in and I'm diggin' it. The contest calls for you to read about 75 pages per week, and the Infinite Summer blog features interesting essays from particpants. I've been struggling to make time for reading lately, so this will force me to do it. I apologize for the lack of bloggage this week. I've been spending a lot of time watching our brand new 37-inch flatscreen TV. The thing's frickin' huge, at least compared to what we've had previously. We were thinking about getting a bigger one, but this was the biggest we could fit in our entertainment center. And it's fine. It's an HDTV, but we haven't ordered a new DirecTV HD box yet, so we're not getting the hi-def picture. Can't wait to watch football and hockey on it in the fall. We're finally getting some summer-like weather, although it's of the volatile Florida variety, with thunderstorms expected to rumble through every day for the next week or so. It rained all week until yesterday, so I was stuck doing a couple of treadmill runs. Getting out for a 15-miler tomorrow morning, hopefully before it gets too humid. Hannah lost her second tooth this week, with a little help from her sister. She had a tooth that was already loose and was wrestling with Lily when a stray knee caught her in the mouth and actually knocked the tooth right out. There was a little blood but Hannah was very calm about it, no doubt imagining the Tooth Fairy winfall. I've got some interesting developments with the podcast in the works, but I can't say anything just yet. Hopefully more details early next week. In the meantime, I'm hoping to do some recording of new material on Sunday, so we'll see if that happens. Quite the week for celebrity deaths, huh? I kind of feel bad for Ed McMahon and Farrah Fawcett in that they were totally overshadowed by Michael Jackson's bizarre death yesterday. I'm not going to get into it, because really, haven't you heard enough already? And besides, there's still the funeral, the autopsy, the tribute albums, the unreleased recordings, etc. Jacko will live on. The NHL draft took place tonight, with the Islanders sticking with pre-draft favorite John Tavares as the top pick. The Leafs were hoping to trade up to get him, but were unable to, so they took Nazem Kadri, a Canadian of Lebanese descent, with the no. 7 pick. There was much talk earlier in the day of possible trades, but the only one that happened was Anaheim trading Chris Pronger to the Flyers for a combination of players and picks; I still want to see how they fit his huge salary under the cap. But however they do it, they're going to be tough to face next season. A rumored trade that would have sent the Leafs' Tomas Kaberle to Boston for Phil Kessel never happened; frankly, it seemed unlikely to me. But it does appear that the Leafs are shopping Kaberle, so that should be interesting. I'll be sad to see him go; he's an excellent d-man making a reasonable salary by NHL standards. And the fun continues next week, as free agent season starts on July 1. In this episode of the podcast, Rick Johnson and I discuss social media and its ever-growing presence in everyday life. Click here to listen to the episode in streaming audio or download it directly here (right click and "save as"). - Social networking is like weed? Completely Conspicuous is available through the iTunes podcast directory. Subscribe today! The Yo La Tengo song is on the band's new album Popular Songs on Matador Records, where you can download the track. The Patterson Hood song is on the album Murdering Oscar (and Other Love Songs) on Ruth St. Records. Find out more and download the song at PattersonHood.com. The Polvo song is on the album In Prism on Merge Records, where you can download the song. Jay Breitling produced the opening and closing themes of this show. You can find out more about Senor Breitling at his fine music blogs Clicky Clicky and Keeping Some Dark Secrets. Additional music used in the show is by Me and Boris the Bull, which is the brainchild of the mighty Mark Campbell. Completely Conspicuous is a Tan God Production. And the rain just keeps on coming...it's supposed to let up by the end of the week. We got a brief respite on Friday afternoon when we drove down to New Jersey. By the time we got out of Massachusetts, the skies started brightening and it was downright sunny and nice in Ringwood. We got there in time to head down to the lake for the first "Fabulous Friday" of the year, which is a community thing where there's a big cookout and everybody just enjoys it. They had a guy playing acoustic rock including some Dead, Neil Young and Kinks tunes, so I was digging it. And the kids had a blast playing on the beach and the playground. Deb and I got up early Saturday (5:45) to get the kids ready and out to the start of Tricia's triathlon at Franklin Lakes. The weather was nice. There were about 900 entrants in the event, which started with a quarter-mile swim around the lake. Tricia was nervous, but she did great. She said afterwards there were so many people around her that she was only able to do the dog paddle for most of the swim, but she was calm and got through it. The bike portion was 17 miles, so we just hung out with the kids at the finish and waited for her to get back; we had some other folks out along the course who let us know when she was on her way back. Then she had a 5-mile run that wound around the neighborhoods near the finish. Every time we saw her she had a smile on her face and she finished strong in 2:21. In fact, she's already signed up for a shorter tri in August. Not long after she finished, the skies darkened and it started to rain lightly but steadily. I had planned to run 13 but I ended up doing 10 miles; felt a little twinge in my left knee about halfway through, walked a little, but was able to finish pretty strong. I saw a couple of good-sized deer as I was heading out of Ringwood State Park. I was happy to get the 10 in. The rain picked up as the evening wore on and Matt and Tricia threw a party to celebrate Tricia's great accomplishment. I stopped drinking around 6:30, which was a good move; kinda had a headache, anyway. I got a good eight hours of sleep, which was nice and which I knew I'd need since I was going out later. We hit the road around 10:30 and got home in time to relax a little. I headed into Cambridge at 8:15 to go to the Condo F**ks/Bevis Frond/Sleepyhead show at TT the Bears; the sold-out concert was a celebration for the 25th anniversary of Jon Bernhardt's great Breakfast of Champions show on WMBR, the MIT college station that we listened to at Webnoize every day. I listened to 'MBR on the Web for several years afterward, but the last few I haven't because my RealPlayer kept crapping out. Anyhoo, I was supposed to meet OJ and Doobs at the club, since they both had tickets. I got there a little after 9, picked up a Tremont Ale and watched Sleepyhead's set. They were excellent, with good vocal harmonies and punchy pop-rock tunes. The place was full of aging indie rock hipsters, as well as some of more recent vintage. OJ showed up around the end of Sleepyhead's set and I hung out with him in the back of the club for all of the Bevis Frond's set, which started out acoustic. Mary Lou Lord joined him to perform "Lights are Changing," the BF song she covered for a minor FM hit in the late '90s. Then BF (aka Nick Saloman) rocked it up with pair of locals as his backing band; he flew over from England especially for the occasion. My brother and I saw him play at South by SouthWest in Austin back in 2000 and he had impressed me then as an excellent guitarist. This time around, he looked a bit ragged and a lot older (he's 56), but he sounded great and seemed to have a really good time. I shook his hand after his set as he went to get a beer and he had a big grin on his face. The Condo F**cks (aka the great Yo La Tengo; this is a side project that traffics in garage punk) were supposed to come on at 11:15, but since Bevis Frond went over, they came out at 11:50. They proceeded to bang out the majority of the new CF covers album in quick succession and with great fervor. OJ took off at 12:30 because he had to get up early for work; I did, too, but I figured I'd lasted this long, I might as well see it through. They powered through 20 more minutes, playing a new YLT song and then bringing up the other bands for a tribute to Chris Knox of New Zealand's Tall Dwarfs; Knox had a stroke recently. 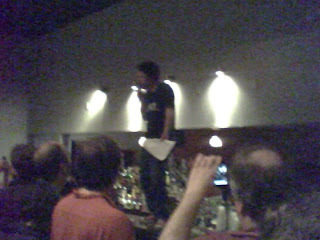 The conglomeration played "The Brain That Wouldn't Die," with YLT/CF frontman Ira Kaplan singing while wading into the crowd, to the back of the room right in front of me, and then jumping up on the adjacent bar to belt out a few verses before making his way back to the stage (see the accompanying photo). It was pretty great stuff. I was home by 1:30 and got about 4.5 hours of sleep last night, which made for a long day today. But I got through it and it was a great weekend. Now excuse me while I pass out. When did New England turn into the Pacific Northwest? This gloomy weather is supposed to continue all weekend and into next week. We're going down to NJ again tomorrow to cheer on Tricia as she does her first triathlon, but alas, the weather is supposed to be pretty soggy down there, too. After months of hemming and hawing, I finally took the plunge and got a Twitter account. My address is http://twitter.com/koomdogg in case you want to follow me, or you can just visit here and see my latest Tweets in the lower righthand corner of the page. I've signed up to follow a bunch of interesting folks, from friends to celebs to stuff like The Onion and CNN. I'm not going to do much of the "going to the store LOL" tweets that some folks do; more like posting interesting links and things like that. Because I don't have enough stuff to do on the InterWebs. Speaking of which, my running column this week was supposed to run today but got pushed back to Friday, so I'll post a link when I get one. [UPDATE: Here it is.] As for actual running, I sat down and counted back 16 weeks from October 4 and realized on Wednesday that this week is actually my first training week for the Maine Marathon, not next week. So I did a track workout yesterday and will do a 13-mile long run down in Joisey after Tricia finishes her tri. My right IT band's still ridiculously tight and my back's sore from sleeping on it wrong, but that's why they invented Aleve. Deb's last day of the school year was today, so she's pretty psyched. Lily finished up last week and Hannah's last day is next Wednesday. At least I won't have to get up as early for a few months, although I'm sure Lily will wake me up well before my alarm goes off. It's hard to figure out the Blue Jays this year. They get swept by the Marlins last weekend and then go into Philadelphia to face the defending World Champs and sweep them. And they do it with the best pitcher in baseball, Roy Halladay, on the DL, along with their closer Scott Downs and starter Casey Janssen. At least Halladay, who's nursing a sore groin, will be back on the 28th. They basically put him on the DL so he wouldn't have to bat against the Nationals (stupid interleague play!) and aggravate the groin some more. But Downs is on the DL with a bruised big toe, which he hurt when he was running out a ground ball. Seriously, some of these baseball injuries are ridiculous. Meanwhile, the Stanley Cup playoffs just ended and you had Sergei Gonchar playing with a torn MCL, Nick Lidstrom playing after undergoing testicle surgery (! ), and everybody pretty much just banged up to hell. Hockey players = tough bastards. Baseball players = not so much. The NHL Awards were given out tonight. A big night for the Bruins, with goalie Tim Thomas winning the Vezina, monster Zdeno Chara winning the Norris for best d-man and Claude Julian winning for best coach. Bet they'd trade all that hardware for the Stanley Cup. Alex Ovechkin won the Hart for league MVP and the Pearson as players' choice for most outstanding player. I TiVoed the ceremony because I was playing hockey tonight and just fast-forwarded through it, but it was kinda goofy because they had current and retired players handing out awards with celebrities and it led to some pretty awkward cue card reading of stilted awards show banter. This is nuts: A federal jury found a Minnesota woman guilty of illegally downloading 24 songs and fined her $1.9 million, or $80,000 per song. Un-freaking-believable. The podcast's back with part 1 of my conversation with special guest Rick Johnson as we reminisce about our days as teenage metal nerds. Listen to the show in streaming audio here or download it directly here (right click and "save as"). The Early Man song is on the album Closing In on Matador Records, where you can find out more and download the song. The Sword song is on the album Gods of the Earth on Kemado Records, where you can find out more and download the song. from "Salutations From the Ghetto Nation"
Jay Breitling produced the opening and closing themes of this show. Find out more about Senor Breitling by checking out his fine music blogs Clicky Clicky and Keeping Some Dark Secrets. Additional music used in the show is by Me and Boris the Bull, which is the brainchild of the mighty Mark Campbell. Another weekend just flew by. Not bad by any stretch of the imagination. On Friday, I went to an after-work farewell for my supervisor, who left for a new gig. Good time. Picked up the girls from a friend's place because Deb was out with friends and got home in time to watch Pittsburgh knock off Detroit 2-1 to win the Stanley Cup in seven games. It was a great game and a nice way to cap a great series. It came right down to the last second, as Penguins goalie Marc-Andre Fleury had to make a spectacular diving save on Wings captain Nicklas Lidstrom with 1.2 seconds left to preserve the win. All in all, an exciting playoff season. Yesterday, I got out and ran a strong 8-miler in the morning. In the afternoon, Hannah wrapped up her spring soccer season and then we headed up to NH to take my mom out for a belated birthday dinner at a pub in Hampton. We were about halfway through it when I happened to absentmindedly look over to the next table and noticed an old high school buddy out with his family. We might get together and golf next month if we can make the schedules work. After we got home, we found out that the folks who bought the house diagonally across Rt. 1A from us were having a huge housewarming bash. Not long after moving in, they had a huge eyesore of a wooden fence erected around the property, and now I know why: it makes it a lot easier to have a big party in your front yard. I guess they invited some of the neighbors and there were a ton of people there; lots of loud music (I heard some TV on the Radio and I think !! !, so a pretty decent soundtrack) that was blaring until about 10:30. I was impressed that nobody called the cops on them. Back in the day, I had a few house parties busted up after neighbors made noise complaints. Honestly, I don't have a problem with it as long as it isn't in the middle of the week, and even then I would never call the cops. Today, we took the girls to a birthday party at the Roller Palace. I had planned to rent skates so I could skate around with Lily, but when I tried them on, I realized it had been about 30 years since I'd worn those old-school skates. I have rollerblades that I can get around on pretty well, but I forgot to dig them out of the basement. So I ended up walking around the rink with Lily, who was on rollerskates for the first time. She did really well, falling down a few times but getting the hang of it and having fun. Hannah had done it once before and was having a blast skating around with her friends. We didn't get a new TV yet; waiting on another check or two to come in first. Also, had a false start on the podcasting plans today. I'm hoping I can record it tomorrow or Tuesday. Can Sarah Palin go back to governing her state or whatever the hell it is that she does? Because this whole non-story about her slamming Dave Letterman for a couple of jokes he made is flat-out stooooopid. Enough, already. Man, right when the Jays get their act back together again, Roy Halladay tweaks his groin and they promptly get swept by the frickin' Marlins. Hopefully he'll be okay with some rest and back by next weekend as they plan, but suddenly they're 5 games out and tied with Tampa. Sad story out of Stoughton, where a 4-year-old girl was in a crosswalk yesterday when she was struck by a car driven by an 89-year-old woman; the girl died today in a hospital. This is the third accident involving an elderly motorist driving into people in the last two weeks. Much love to the senior citizens, but when are we going to start testing drivers over a certain age? I've seen more than a few folks driving who looked like they were in no condition to be operating a vehicle. It's bad enough when you've got folks distracted by their cell phones; at the very least we should be ensuring they're mentally competent to even get in a car. Man, we have had some crappy weather around here lately. Just rainy, cloudy, chilly and blah. Some June we're having. The weekend is supposed to be sunny and in the 70s, so let's hope it happens. This stuff is just depressing. Lily had her last day of preschool today. Hard to believe she's going to kindergarten in the fall. Meanwhile, Hannah was diagnosed with strep throat on Monday and after getting some antibiotics is feeling a lot better. Unfortunately, Tuesday morning she woke up early and was vomiting bile every so often; she hadn't eaten much of anything for two days. We were worried she wouldn't be able to eat anything and she couldn't take her medicine on an empty stomach, but eventually she got some food down and by the end of the day was back to normal. Just got back from my second night of hockey this week at Pingree. I don't plan on playing twice a week all the time, but it was fun to do it. Scored a couple of goals Tuesday night, but tonight I found myself on defense most of the night. No goals were scored while I was on D, though, so that's something, although it probably has more to do with the goalie than anything else. Not as many high school kids played tonight, mainly because tonight was prom night in Beverly. We've got a busy weekend ahead. Tomorrow, I'm going out after work for a farewell party for my supervisor, who took another job. I plan to be home by 8 to watch game 7 of the Stanley Cup finals. Go Pens! On Saturday, Hannah's got her last soccer game of the spring and then we're heading up to NH to take my mom out to dinner for her birthday, which actually was this past Monday. We also might buy a TV while we're up there. On Sunday, I'm hoping to get together with my buddy Rick to do some podcast recording. And I need to get a long run in at some point. This is a fine transcription of Joe Cocker's Woodstock performance of "With a Little Help From My Friends." As I mentioned earlier, the Stanley Cup finals go to a game 7 tomorrow night. And if you make it this far, chances are you're playing with some sort of injury. An 80-game season, followed by four best-of-7 playoff rounds can lead to some serious wear and tear. In the case of Detroit captain Nicklas Lidstrom, it was a "near catastrophic" testicle injury. Damn, it hurt just to type that sentence. So Cher's daughter Chastity is in the process of becoming a guy. As you were. Now that Phil Spector is finally in jail, his freaky wigs have been confiscated, revealing his even freakier Gollum-like countenance. Yikes. It's no fun having a sick kid, especially for the sick kid. Poor Hannah felt kinda lousy all weekend, complaining of a sore throat. We took her temperature yesterday afternoon and found she had a fever, so we kept her home from school today. This afternoon, Deb took her to the doctor and found she has strep throat. So we've got the antibiotics and she should be okay in a day or two, but I felt so bad for her. She won't eat much because it hurts to swallow and she's listless because she hasn't eaten a whole lot the last two days. And of course, her little sister is pissed because big sis is getting all the attention. Fun times. For avid consumers of television content, we've never forked out the dough for a nice TV set. We've always had hand-me-down sets from various relatives, but that may change soon. After our main TV was rendered unusable by me yesterday because the "on" button broke off (long story), I hooked up our other TV in the living room, only to realize there's no way to connect the DVD player to it. And we finally realized, maybe it's time we actually bought a decent TV. So I've been checking out the sales fliers for a flatscreen HDTV; it won't be one of the ginormous ones, but I've got my eye on a 42-inch set. We still have to research whether we want to pay more for the HD programming through DirecTV, but it'd be cool to have a state of the art TV for a change. It was a lazy weekend. We didn't have anywhere to be for the most part, which was kinda nice. After a week in which I only ran once, I got a 7-miler in Saturday morning and felt pretty good. Ran again today and felt great, so the hamstring issue is gone. I think it was just the delayed aftereffects of that trail run last weekend in NJ. Which made me realize that it would be stupid to run both the Maine Marathon in early October and then that 50K trail run two weeks later. They're just two totally different types of events that require different types of training. So I'm going to just do the Maine Marathon, because I want to shoot for another PR. I'll do the 7-mile portion of the trail event instead, which I should be able to handle easily. I'm glad I figured this out now, because I have to start training for Maine in two weeks. Bret Michaels of Poison has had a career renaissance in recent years with his uber-sleazy "Rock of Love" series of "reality shows." So much so that Poison played at the Tony Awards last night for some reason. All was good until a set piece landed right on his head. Ouch. He's got a broken nose, but I bet he's enjoying the attention. Stephen Colbert's in Iraq this week doing his show and as part of the first one, he was given a buzzcut by a general at the order of President Obama. Big game 6 tomorrow night in the Stanley Cup finals. I was excited for the Penguins to take control of the series Saturday night after tying it at 2 on Thursday, but instead they turned in their worst performance of the playoffs. Hopefully, the Pens can get it back together and win tomorrow night to force a game 7 Friday in Detroit. There are many things that make me feel old these days. Here's one of them: Today marked the 20th anniversary of my first day in the working world. On June 5, 1989, I began work at the Peabody Times, the newspaper where I was an intern the previous summer. I had just graduated from the University of New Hampshire with an English/Journalism degree and was full of youthful enthusiasm. I had a blast during my internship, although I had to practically beg my editor to let me cover stories because the previous intern had quit after a couple of weeks (they managed to convince him to come back, but he hated every second of it). I was able to get some decent clips during the internship and headed back to college for my senior year. I impressed the editors in the head office enough to get offered a job a month before graduation. My first story was a "man on the street" piece, a regular feature called "Street Talk" that none of the reporters liked doing, because you had to walk up to random people in downtown Peabody and get their opinions on a particular topic. And you had to take their photos with a point-and-shoot camera. And give out these lame "Street Talk" pencils; I think I still have a couple somewhere. The Street Talk topic that day was about the historic protests in Tiananmen Square in Beijing, China, that had occurred the previous day. Of course, a couple of people didn't know what I was talking about and a few didn't want anything to do with me, but eventually I got enough folks to talk to me. And that was the start of my illustrious career in journalism. I lasted another six years at the paper. Four of them were in Peabody under four different editors, working first as a general assigment reporter, then covering the schools beat for two years, and then a final year as City Hall reporter. I then moved over to the Beverly Times, the sister paper of the Peabody paper and the head office of the four-paper Essex County Newspapers chain. I was county reporter for a while before becoming a layout editor for nine months. Alas, the 5 a.m. to 1 p.m. shift didn't suit my nocturnal ways and I found myself constantly sleepy and developing what I thought was an ulcer. I also missed reporting and writing, so when a reporting job covering the courts opened up and I went for it and got it. That was a fun gig for a year and a half, until ECN bought the rival Salem News and merged it with the Beverly and Peabody papers. I found myself reassigned to cover Marblehead, sitting in boring selectmen's meetings I thought I'd left behind. I started looking for another job and after a month, found one at a small publishing company in, of all places, Marblehead. And so I left the world of newspapers behind for steady hours and a job writing about healthcare. It was a tough adjustment at first, not just mastering the new subject matter, but also just the fact that I was sitting in an office all day instead of driving out to cover stories. It took a few months and for a while, I was wondering if I had made a mistake. But it ended up working out okay in the end and I'm still working there today, albeit with a two-year departure from '99-'01 to work at a dotcom. Coming out of college, my plan was to work a couple of years in Peabody and move on to a bigger paper elsewhere, eventually landing a job in a big-city paper like the Boston Globe. I actually interviewed at the Globe in '93 for an internship and it seemed to go well, but I think I blew it when I was meeting with then-editor Ben Bradlee Jr. and at the end of the interview, he asked me if I had any questions. And I had done fine until that point, but I was nervous about not having a question, so I just blurted out a stupid question about whether there were health benefits. Of course there weren't, it was a friggin' internship, and I didn't care about benefits. I just wanted the gig, because something like 70% of interns used to get hired on staff back then, or so I was told. Bradlee looked at me like I had three heads and said no, and I was sent back to the intern coordinator I had initially met with. And I fear that my stupid last impression may have cost me a gig with the Globe. Two and a half years later, I was out of the business. But looking at the state of the newspaper biz nowadays, maybe it was a good thing I blew that interview. I'm pretty wiped at this point, but wanted to post something because it has been several days. For some reason, my right hamstring was really tight today, just in time for me to play hockey for the first time at Pingree. I ran 5 miles yesterday and didn't push too hard and the hammy didn't start bothering me until this afternoon, after I went to the gym and did a chest workout. At any rate, I was able to skate without any problems; it was when I was on the bench that the leg really bothered me. It was a different kind of skate in that they use a buzzer that goes off every couple of minutes to signify a line change. I've never played with a group that does that, but it's good in that it ensures that everyone gets the same amount of ice time. There was a wide age range of skaters, from high school kids to one guy who was 77 (and a pretty good player). The talent level was not quite as high as my Lynn skate, which was good since I was stuck on defense the whole night, which is not my strong suit. I played pretty well for not skating for the last month and popped in a goal and an assist. These guys skate every Tuesday and Thursday, so I should be able to get at least one skate in a week for the summer. Got home in time to watch the third period of the Penguins-Wings game; nice win for Pittsburgh to tie the series at 2. I had planned to run tomorrow, but we'll have to see how the hamstring feels. I ran yesterday for the first time since Saturday's trail run because my right ankle was pretty tender. It hurt at first but then felt fine after a few minutes. Newsweek is turning over next week's issue to Stephen Colbert, so I might actually have to pick that up. Here's a movie I'd like to see. Khaaaaaaaaaaannnnnnnnnn!!!!!!! Sad news about David Carradine being found dead in his Bangkok hotel room. He'll always be known as the guy from "Kung Fu," but I thought he was great in the Kill Bill movies, too. Here's the conclusion of my conversation with Ric Dube about movies. Click here to listen in streaming audio or download the episode directly here (right click and "save as"). The Art Brut song is a b-side from the band's album Art Brut vs. Satan on Downtown Records. Find out more at . The song is courtesy of RCRDLBL, where you can download the song. The Andrew Bird song is on the album Noble Beast on Fat Possum Records, where you can download the song. Another year keeps flying by. Welcome to June. We had a whirlwind of a weekend down in NJ, driving back home in the midst of a rainstorm yesterday afternoon. The trail run with Matt and Joe Saturday was fun and challenging. We ended up doing about 11 miles in 2:50, which sounds excruciatingly slow until you consider some of the seriously steep hills we climbed. Lots of rocks, branches, tree roots, grass, creeks...but fortunately no bears. Some mountain bikers we ran across said they saw one, but we didn't. Joe is running the Covered Bridges half in Vermont next weekend and was just bounding through the trails. It was all I could do to keep up with him. Matt was struggling, but only because he did some crazy hill repeat training the day before and his legs were hurting. So I made it all the way until about a half-mile to go when I totally rolled my right ankle; hurt like a mofo. I hobbled for a while and then ran a little. It's still pretty sore, but not too bad. I'm supposed to run tomorrow, so we'll see how that goes. Guess I'm gonna have to get me some trail shoes. One thing's for sure, that fall 50K I'm thinking about is going to be killer. Saturday night, Matt and I went to a Little League fundraising dinner while the wives took care of the kids and had takeout Thai food. Matt coaches Danny's team with a couple of other folks and we hung out with them. So the event was called a "beefsteak," which is apparently a common New Jersey function. It reminded me of a Brazilian BBQ in that the servers would bring around food--in this case, trays of beef on small pieces of bread, slathered in butter--until you said "no mas." You basically ate as much as you could until you were absolutely stuffed to the gills. The key was not to eat the bread. We brought a cooler of beer with us, so it ended up being a long night. Matt didn't realize that there was entertainment in the form of three comedians; we didn't get out of there until after 11:30. I was kinda bummed I missed all of game 1 of the Stanley Cup finals, but it was a good time. I was worried I was either going to be hung over and/or ill from all the food, but I felt okay in the morning. We had to be at the church by 7:30 for Danny's communion. It went great and Danny and his cousin Jimmy did well; of course, the girls weren't used to sitting through a 90-minute church service and were getting hungry, but they didn't whine too loudly. We went back to the homestead for a small shindig before hitting the road at 12:30. On the hockey front, I found a skate at Pingree in South Hamilton; they play on Tuesdays and Thursdays and need guys. The husband of a former co-worker of mine plays there, so I'm going on Thursday to see how it goes. It starts at 8 p.m. and is a 15-minute drive, which sounds pretty great right there. Well, there were two games in two nights and Detroit won them both. Pittsburgh played well, but not well enough. Unfortunately for them, against a team as good as the Wings, you need to play mistake-free hockey. Hopefully, they can take their two home games this week. I suppose it was inevitable: Some Twitter twit ran into a tree because he was Tweeting while running and now he's famous. Wow, I can't believe I just wrote that sentence. Scary story about that Air France plane that went missing over the Atlantic. Looks like there were multiple malfunctions and the plane crashed into the ocean. It's hard to imagine that so many things were wrong with the plane and yet nobody caught it in the pre-flight checks.